Two things can be said for Adirondack architecture. It’s eclectic, to put it mildly. And there is no distinctly Adirondack style. Oh, we talk about rustic, but that’s as much a décor and an invention of modern real-estate agents, curators, and retailers. 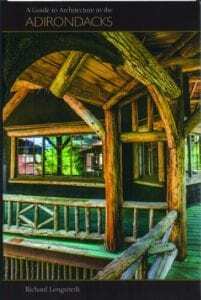 Those are some of the conclusions that can be drawn from two new books that not only discuss architecture in the Adirondacks in considerable detail, but also help you find it. 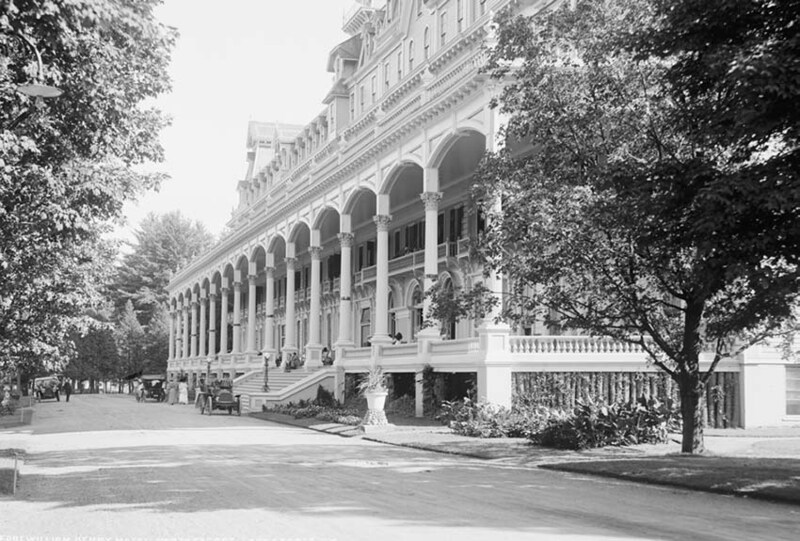 Fort William Henry Hotel in Lake George in the early twentieth century. Neither Janet Null’s The Adirondack Architecture Guide: South-Central Region nor Richard Longstreth’s A Guide to Architecture in the Adirondacks is what you might expect of a typical architecture book: big, hefty “coffee table” things, meant to be laid out indoors so the viewer can admire stunning photos of Great Camps, log chapels nestled on conifer-covered islands, and other icons of high-class Adirondack construction. These books are small, compact, easily carried. The keyword in each title is guide. 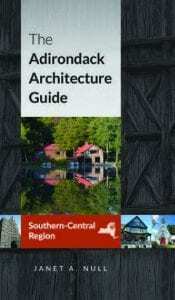 Think “trail guide” to buildings, meant to be taken along as you walk or drive the main roads, byways, and streets of the Adirondacks and look at the real thing, not glossy pictures. It’s a wonder this hasn’t been done before. Null’s is the first volume of a projected trilogy; the publisher won’t commit to a timetable for the other two, Northern Region and Eastern Region, other than to indicate “soon.” Null comes with solid credentials: president of an architecture and preservation firm, she has practiced her profession in the Adirondacks for a quarter of a century. And she writes serviceably. This volume covers the largest area of the three, from the southern and western extremities of the Blue Line east to the Northway and north to the doorstep of the High Peaks. Conversely, an essay on the rise and fall of Adirondack railroads seems misplaced, particularly since it says little about related architecture. Far better would have been a discussion of the quirks and oddities of depot design. Similarly, a chapter on tanneries feels superfluous in view of the fact that, as Null concedes, they no longer survive and were not distinguished architecturally. A chapter on churches would have been more relevant. But it’s the tours themselves that readers will find most useful. Numbered locations keyed to legible maps take us to the architectural highlights throughout the book’s territory. A brief description is almost always accompanied by a four-color picture. The pictures are awfully small and the print tiny, but that may be necessary for the book to be as portable as it is. Along the way we find homes, inns, churches, boat shops, cabin colonies, cheese factories, schoolhouses, sawmills, fire towers, dams, false-front stores, repurposed train stations, and just about any other structure you could imagine. Longstreth’s book is in many ways comparable, with the advantageous exception that its purview is the entire Adirondacks. He, too, is well-qualified: professor of historic preservation, past president of the Society of Architectural Historians, board member of Adirondack Architectural Heritage (the book’s publisher), and the Fort Ticonderoga Association (among other groups), longtime summer resident of the High Peaks region. He spent six years and drove twenty-five thousand miles in preparing this book, and it shows. Some 450 entries are drawn from all corners of the Park. Whereas Null doubles as a travel agent, outlining specific tours, with Longstreth you’re on your own, but thanks in part to equally good maps and clear directions it’s easy to cobble together an informative drive to suit yourself. The book is organized into a dozen geographic sections, from Lake George more or less counterclockwise to the northern extremity of the Blue Line and then back down to “Southwest Lakes” (the Fulton Chain, Big Moose, and so on). Like Null, Longstreth leads off with a lengthy introductory section. Here he points out that one reason that no distinctive Adirondack style of architecture evolved was that “during the late 19th and early decades of the 20th century, an increasing number of the Adirondacks’ most prominent buildings—banks, churches, hotels, libraries, schools, store blocks, and sizable residences—were designed by outsiders in ways that transcended localisms.” These outsiders, many of them professional architects, brought their own disparate tastes to bear. Later, he argues that “much of the historic landscape of the Adirondacks has been lost” while “many places remain vulnerable,” and he puts in a plea for their preservation. Longstreth, whose style is slightly more academic than Null’s but still accessible, also gives us a short essay on the Northway—a curious inclusion until you realize that the highway, unlike most interstates, was intentionally designed to blend pleasingly with its setting and so in its own way demonstrates a kind of architecture. He discusses its social impact as well, a mix that injects a strength into the introductory material that Null’s book occasionally lacks. Each writer includes a section on fire towers. This also strikes me as curious: it’s hard to think of them as architectural; they’re really just grown-ups’ Erector sets, with interchangeable parts, and all look alike. But Longstreth makes the case that everything demonstrates architecture of some form or style, and his book reflects this belief. You will find not only the buildings you might expect (many of which, such as Custard’s Last Stand in Long Lake, are in Null’s book, too), but also ferryboats, ice castles, bobsled runs, ski jumps, the Wild Center’s “Wild Walk,” grandstands, beaches, and—well, you name it, and if humans were involved in creating it, it’s probably somewhere in these pages. At the outset I said architecture in the Adirondacks is eclectic. Practically every style can be found, from Greek Revival to Italianate to Post-modern to the seemingly out-of-place Prairie; these are succinctly defined in one of Null’s appendices. Null calls some of her examples “extraordinary.” Whatever term you use, employ either book to hop in your car and find the Persons mausoleum in North Creek, Chestertown’s ornate Church of the Good Shepherd, the Kreuzer House off Route 8 in Hoffmeister (it supposedly looks like the Mayflower), the Westport Amtrak station/summer theater, and dozens more, and you will quite literally see that the Adirondacks are a randomly organized museum of American architecture, from the mundane to the exotic and occasionally the bizarre.